Studio Three is a very special retreat. Totally private and located only a few minutes from Mansfield’s main street guests enjoy a queen bed, ensuite with double spa, flat screen TV/DVD and leather lounge. There is also a spacious kitchen and laundry and a BBQ in the courtyard garden. Studio Seven is a very special retreat! Totally private, spacious and luxuriously appointed, the Studio offers guests two bedrooms, two bathrooms, sunken spa, plasma TV/DVD, leather lounge and elegant dining. Full heating and cooling throughout and a full kitchen, laundry and skiers drying room. We look forward to spoiling you! A luxury bed and breakfast accomodation in a rural setting of 92 private, gently undulating acres, on the edge of the Mansfield township. – Two suites have their own spas. The Pavilion has an outdoor heated swim spa overlooking rural scenery, and is available to all guests. Privacy, views, wildlife and luxurious accommodation make it the ideal place to relax and revive, while enjoying all that the Mansfield area has to offer. Coming from Melbourne – Erinview House is on the right hand side of Howes Creek Road, 6.94 km from the Maroondah Highway. The Howes Creek Road turnoff is clearly signposted, 3 km from Mansfield, on the Melbourne side. This is one of the best choices of accommodation Mansfield has to offer for an overnight, weekend or extended stay; a romantic getaway, city escape, retreat, holiday, honeymoon or a special occasion or celebration such as a wedding, birthday or anniversary. Eco-friendly accommodation close to Lake Eildon, Goughs Bay, Mansfield, Merrijig and Mt Buller Stirling, in north east Victoria. 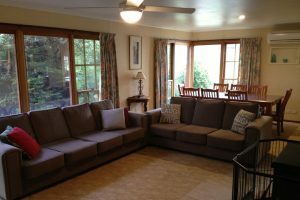 Frogsong Eco Cottages – an environment-friendly holiday accommodation concept at Mountain Bay near Goughs Bay , is an easy 15 minute drive from Mansfield and just 2 km from Lake Eildon. Nestled in the foothills of the High Country, featuring Lake Eildon and Mt Buller, recreation, bushland, wildlife, rivers, mountains, and wonderful scenery. Suits couples, families and groups of up to 15. • Stay in comfort in 5-star Energy rated cottages made of local strawbale and earthen render garnered from the 5-acre landcare setting near Mansfield. • Double glazed windows, thermal and acoustic roof insulation, solar hot water, and a north facing aspect from French windows and individual decks offer comfortable living in any season. • Each unit has lounge, dining and well-equipped kitchen areas, and separate bathroom/toilet. • Two Family size, sleeping 4 – 5: Queen bed and 2 single beds OR bunks – double under & single over. • Two Double size, sleeping 2 – 3: Queen bed plus futon sofa or trundle bed. • 100% cotton bed linen and towels are provided. • Evening meals are available on request, catering for all dietary needs, and using local seasonal produce. • Relax in our attractive grassed and shaded BBQ area between the 2 cottages, permaculture garden or on the roomy deck overlooking the peaceful valley. • Experience the frogsong of our property’s numerous resident Eastern Banjo frogs. • Explore the property’s 5 acres of native open grass and bushland and enjoy the peace, wildlife and views. • Discover the area’s beauty spots and eateries. * A gourmet breakfast hamper is included in tariff, as well as tea and plunger coffee provisions. Smoking is not permitted in the cottages. Planning a special celebration? We can help! Frogsong Eco Cottages offers quality in-house catering for functions, special celebrations and get-togethers. Maximum of 15 in-house guests or 25 dinner guests. At any time of the year there are many things to see and do in this area, to suit all levels of activity. • Plenty of walks and scenic drives throughout the area. The ideal place for a romantic getaway, holiday, or as a base while exploring the sights and delights of the beautiful High Country and alpine areas. and are ideal for couples, families and groups. Carefully chosen decor, polished floorboards and gentle surroundings give the cottages a special ambience. The newly updated kitchens with gas cooktop, microwave, electric frypan, toaster, full size refrigerator, and tea and coffee making facilities are ideal for cooking up a holiday storm. Settle down and relax in front of the TV with FM radio/DVD. Reverse cycle air conditioning, added luxury of wood fire heater in 2 units, separate ensuite bathrooms. *** Please bring all your own doonas, linen and towels. Watch life go by from the private verandahs. Shared BBQ facilities and outdoor seating for any time of the day breakfasts. There is plenty of space for children and your pets to play. Stay only a few minutes from Lake Eildon’s boat launching ramps, where you can enjoy the excitement of water sports. Lake Eildon and the Delatite River are only minutes away for those keen on fishing. and enjoy the peace, nature and the local wildlife. the Goulburn River High Country Rail Trail and the winter snowfields of Mt Buller Stirling. Mansfield and the High Country’s premier snow and lake district accommodation provider. from modern, state of the art Homesteads to Log Cabin acreage properties. The team at Mansfield Holiday Letting are more than happy to assist you with any enquiries, to ensure you find the perfect property for your holiday or long weekend. We have something to suit every budget and preference. ***Office may be unattended due to call outs/inspections. Mansfield township self contained luxury accommodation with views to Mt Buller. Mansfield House comfortably sleeps up to 11 guests. Treat yourself and enjoy everything the tranquil High Country has to offer. An all year round weekend get-away with a difference. Restrictions: No pets allowed. This is a non-smoking residence. Visit many of the local attractions and events held in Mansfield and the surrounding district. 4 star family bed and breakfast motel accommodation, right in the heart of town. Mansfield Spa Retreat is nestled in four acres of picturesque gardens, just a short stroll from the charming shops and culinary delights of Mansfield. Our accommodation includes four spacious, self-contained, private cottages, all with their own luxurious double spa bathroom and wood fire. Ideal for a couple’s romantic escape, a family weekend getaway, or just an extended holiday with a touch of indulgence. Each cottage also includes a generous queen bedroom, private verandah and barbecue, as well as a comfortable studio kitchen/dining & sitting room complete with double sofa bed, television with DVD player, full-sized refrigerator, microwave, electric fry pan, toaster, tea making facilities and coffee machine, and electric blankets. Discover the joys of the bush on horseback with a special day ride package. One of Victoria’s most respected horse safari businesses shows you some of the delights of the area. The Tolmie Cat Barn is the newest cat boarding facility in the Mansfield Mt Buller Stirling area for your special feline. We are a small, cat-only boarding establishment where your cat receives the care and attention they are accustomed to. Each cat has its own custom designed chalet as well as time in a common play area. or they can relax in the comfy cat beds, hammocks or on top of the cat tree. Cats are required to have up to date F3 or F4 vaccinations, worming and flea treatments upon check in. All cats must arrive in a secure cat carrier. Call us for more information and current rates. * Right in the heart of town. * Beautifully presented, cosy, reasonably priced, quality accommodation for all budgets. * Ideal for families and groups. – Lake Eildon only a 10 minute drive away. – Modern one and two bedroom motel-style units and Backpackers Inn in a relaxing garden setting. – Ideal for couples, families, groups, clubs etc. – Have the whole motel (22 beds) and Backpackers (40 beds) to yourselves! 1 BR – single, double or triple occupancy, ensuite. 2 BR family units – occupancy for up to 5 people (QS and 3 King singles converting to a KS and S), ensuite. Communal kitchen for use by motel guests. 11 person room, complete with TV.